To write good sentences, you need to read good sentences. Welcome to Good Sentences, a resource designed by the University of Michigan Law Library to help you find and eventually produce pieces of writing that are clear, compelling, and actually enjoyable to read. Each month, Professor Patrick Barry sends out a menu of reading selections to various students, alums, and other folks interested in becoming better writers. To receive it via email, sign up below! 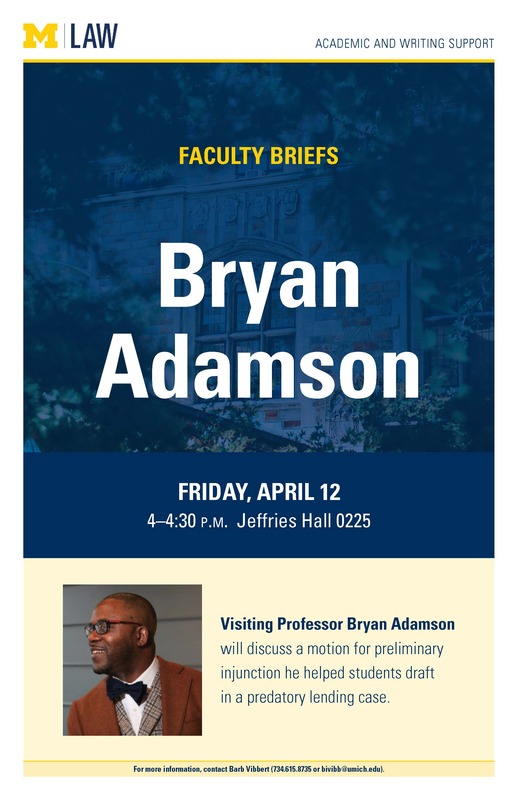 Visiting Professor Bryan Adamson will discuss a motion for preliminary injunction he helped students draft in a predatory lending case. 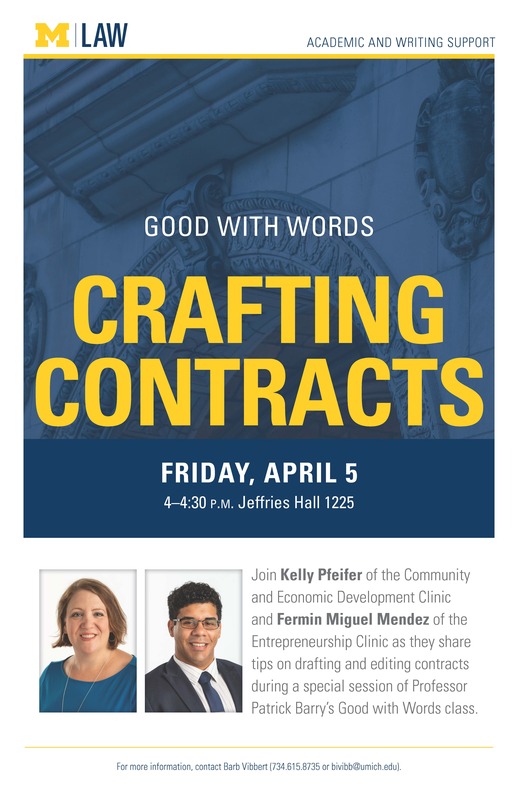 Join Kelly Pfeifer of the Community and Economic Development Clinic and Fermin Miguel Mendez of the Entrepreneurship Clinic as they share tips on drafting and editing contracts during a special session of Professor Patrick Barry’s Good with Words class. 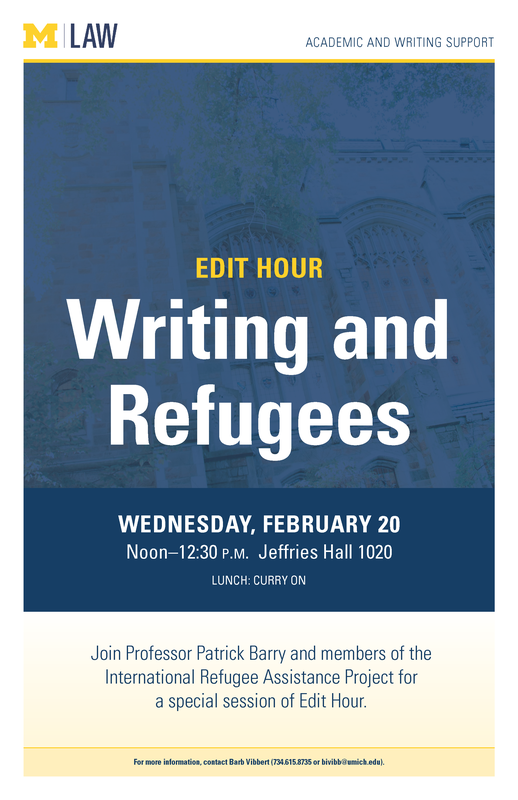 Join Professor Patrick Barry and members of the International Refugee Assistance Project for a special session of Edit Hour. 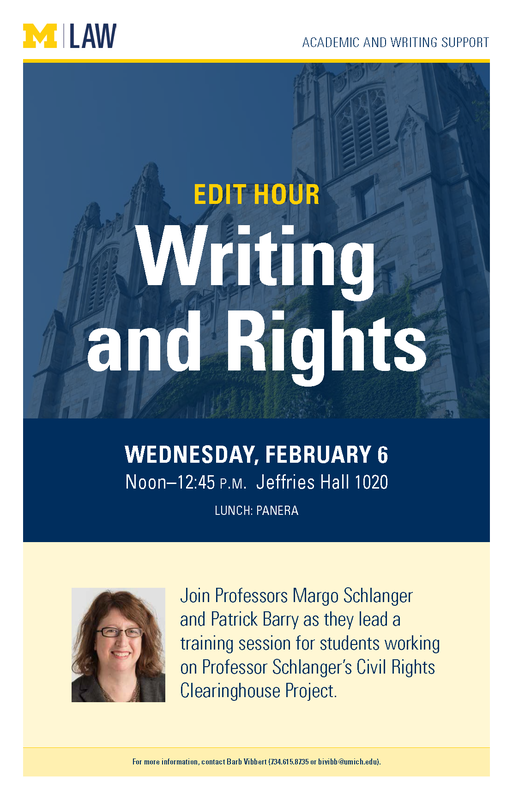 Join Professors Margo Schlanger and Patrick Barry as they lead a training session for students working on Professor Schlanger’s Civil Rights Clearinghouse Project. 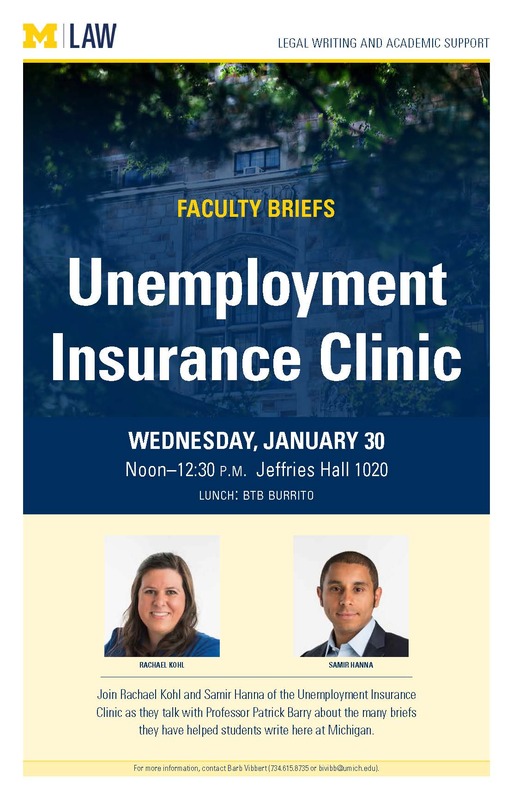 Join Rachel Kohl and Samir Hanna of the Unemployment Insurance Clinic as they talk with Professor Patrick Barry about the the many briefs they have helped students write here at Michigan. 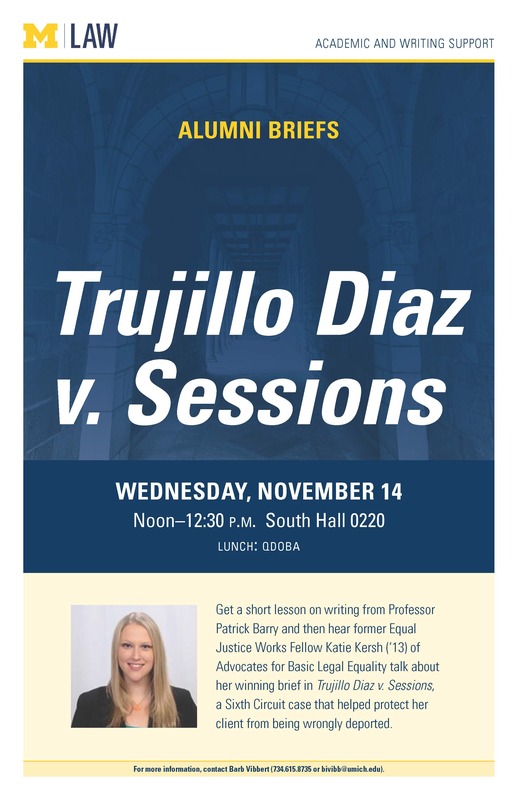 Get a short lesson on writing from Professor Patrick Barry and then hear former Equal Justice Works Fellow Katie Kersh (‘13) of Advocates for Basic Legal Equality talk about her winning brief in Trujillo Diaz v. Sessions, a Sixth Circuit case that helped protect her client from being wrongly deported. 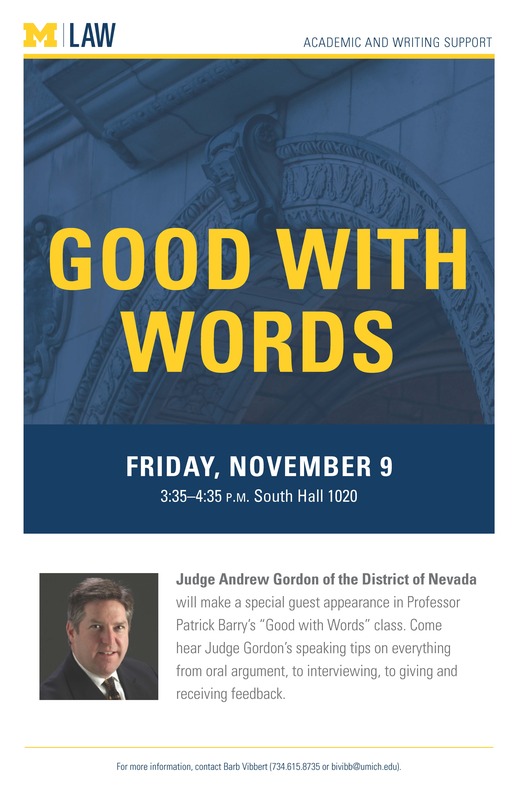 Judge Andrew Gordon of the District of Nevada will make a special guest appearance in Professor Patrick Barry’s “Good with Words” class. Come hear Judge Gordon’s speaking tips on everything from oral argument, to interviewing, to giving and receiving feedback. 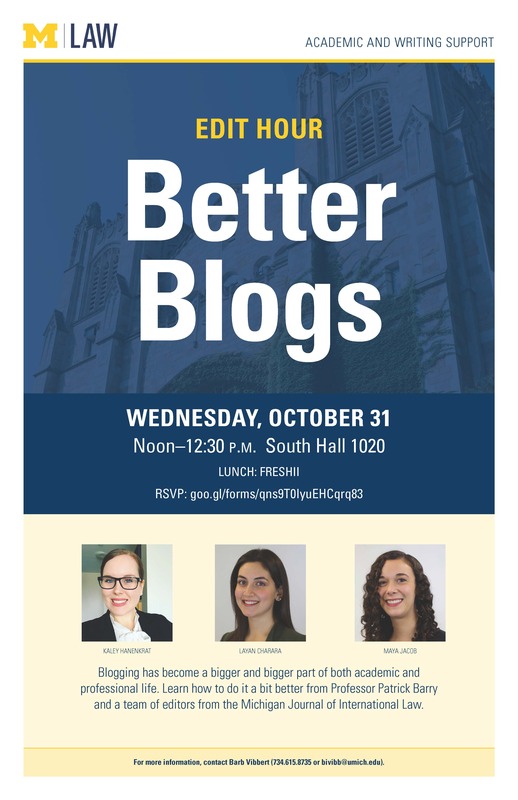 Edit Hour: Better Blogs, Noon - 12:30 pm, South Hall 1020. Blogging has become a bigger and bigger part of both academic and professional life. Learn how to do it a bit better from Professor Patrick Barry and a team of editors from the Michigan Journal of International Law. 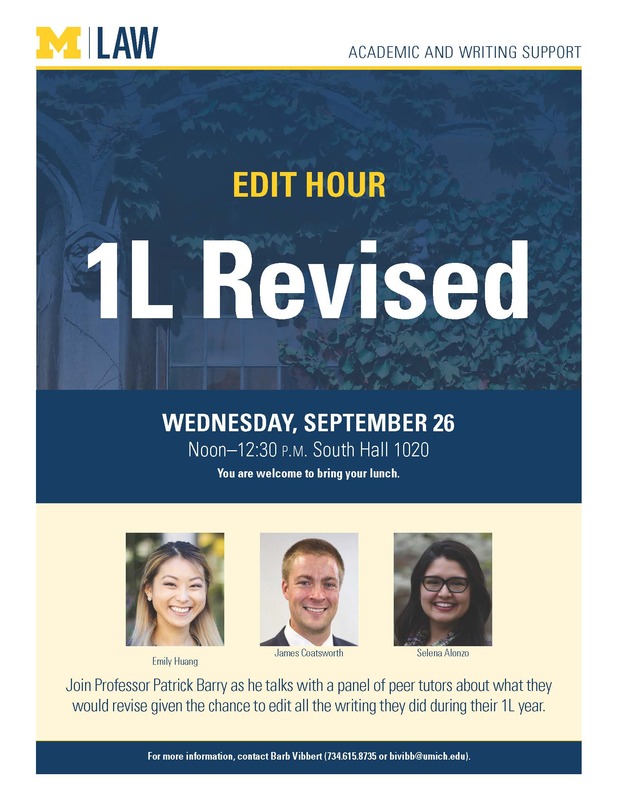 Join Professor Patrick Barry as he talks with a panel of peer tutors about what they would revise given the chance to edit all the writing they did during their 1L year. Contracts are a way to use words to manage risk and relationships. 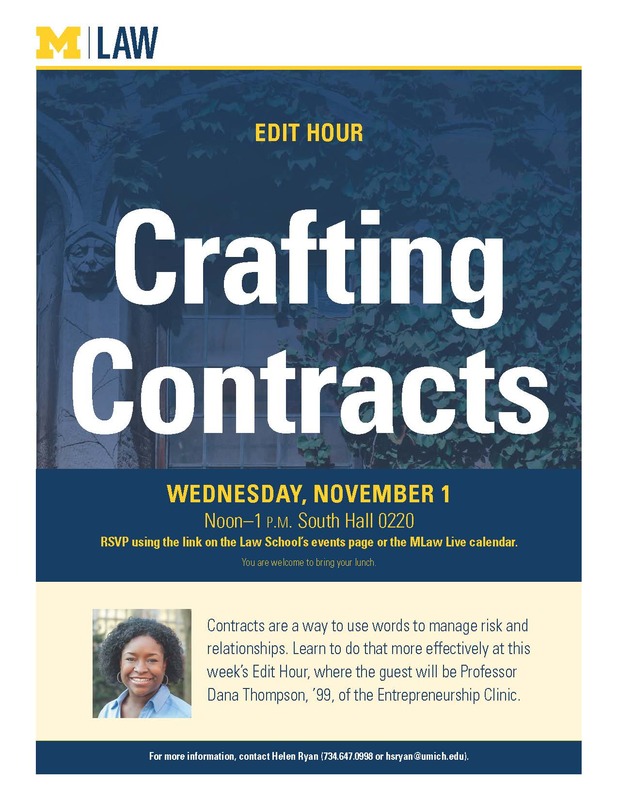 Learn to do that more effectively at this week's Edit Hour, where the guest will be Professor Dana Thompson, '99, of the Entrepreneurship Clinic. Find our archive of past events posters here!